Bigger is better, except when it’s not.  Sure, big boats attract big crowds at boat shows, but a pocket cruiser that offers the amenities and sailing characteristics of a larger vessel and also fits a smaller slip and wallet may be the better answer for some. The question then is, how to fit big-boat fun into a tidy compact package? 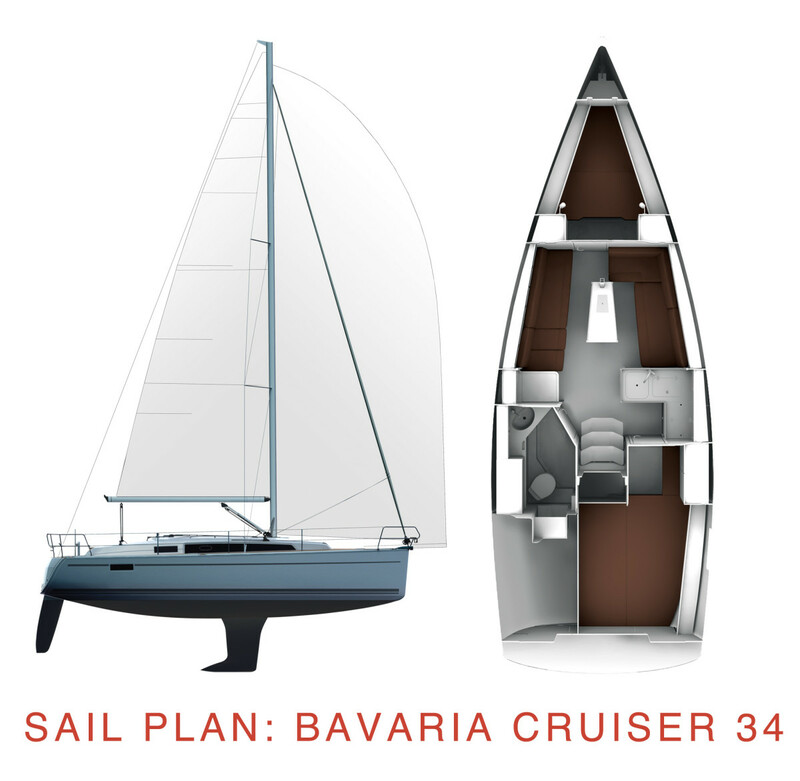 To solve this riddle, Bavaria Yachts tapped into the magic of German engineering to build the Cruiser 34, a vessel that packs in up to three cabins, has a functional cockpit and can sail at 7-plus knots, all with a waterline length of just 30ft. 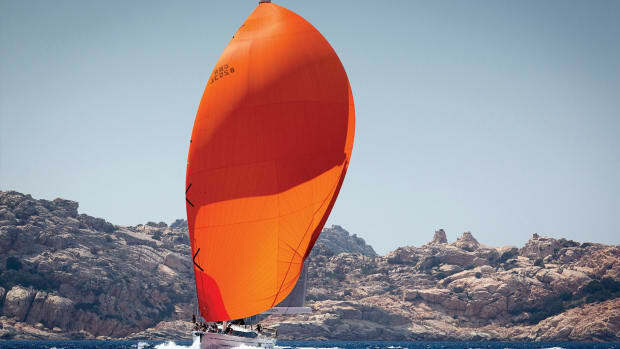 The new Farr design replaces the company’s previous 33-footer and adds a bit sportier profile. The foam core sandwich hull and deck are infused, making for a lighter structure and keeping the boat’s lightweight displacement under 12,000lb. 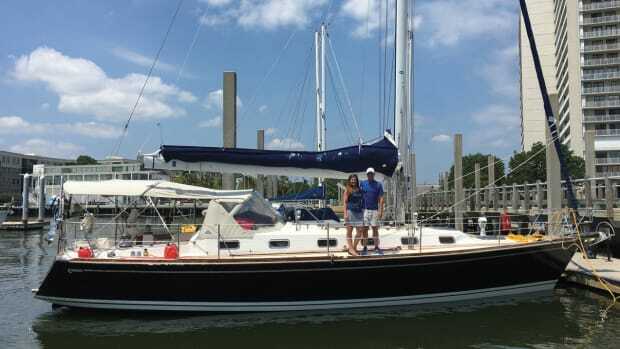 It’s the first in the Bavaria line to be infused, and other models are set to follow. The Cruiser 34’s double-spreader, deck-stepped Seldén rig comes with a rigid boomvang, so there is no need for a topping lift. The sailplan is relatively simple, with a traditional Dacron mainsail, lazyjacks and a sail bag. 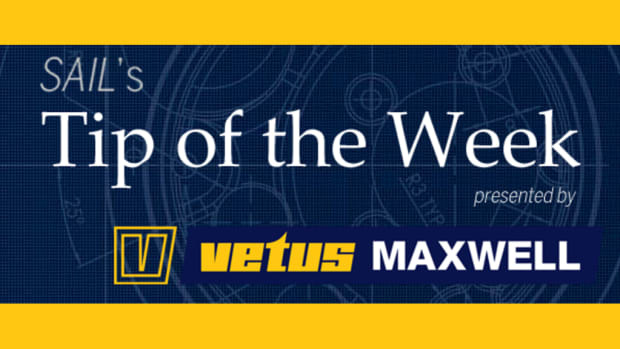 In-mast furling is optional as are tri-radial sails. The short jib tracks are on the cabintop for tighter sheeting angles, while the shrouds are set all the way outboard, making for a clear run forward along the side decks. The drop-down swim platform makes coming aboard easy. The system is a manual one, but the platform is so well counter balanced that it can be lifted and closed with one hand. A choice of one or two helms is available. In the single-helm version, a large wheel is mounted on a pedestal abaft the cockpit table that holds a Garmin 721 multifunction display, wind instruments and a compass. With the twin-helm version, like the one aboard our test boat (which also had carbon wheels and Jefa steering) the MFD is mounted at the aft end of the table on the centerline, and the wind instruments and autopilot are mounted by the starboard wheel. This makes the chartplotter a little harder to see while steering. The two Lewmar primary winches on the cockpit coaming are a bit of a reach from the wheel(s), and two more Lewmar 15 winches are located on the cabintop along with rope clutches to manage the halyards and reefing lines. 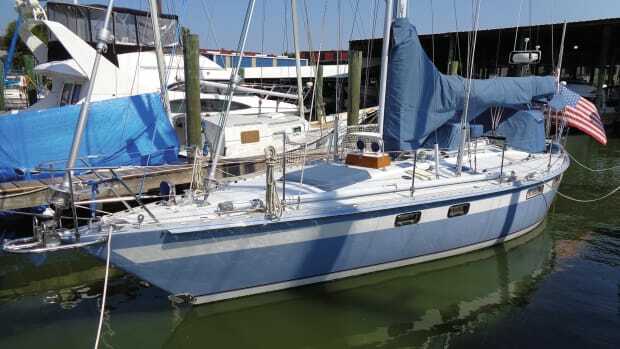 It’s a pretty standard setup that also includes a German mainsheet system. The lifelines are a bit low (especially for taller sailors), but the side gates are wide for loading coolers and other provisions from the dock or a dinghy. Forward, an electric horizontal windlass with a remote control is tucked in a locker behind the roller furler. Bavaria does an excellent job of providing plenty of grab rails, so it’s always easy to find something to hold onto in the cockpit or below. With three cabins, cockpit stowage is limited to two small lockers aft. In the two-cabin version, the portside cockpit bench opens to reveal a deep lazarette. The table has integrated stowage, cup holders and a socket for a light. A nice touch is the standard teak decking on the cockpit sole and benches as well as on the swim platform. Teak side decks are optional. 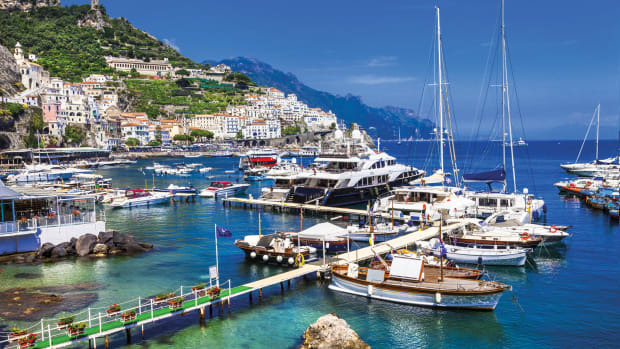 For owners who must have three cabins, this may be the smallest vessel on the market offering such an arrangement. High-capacity interiors are popular in Europe, but it’s a lot to pack in. North American sailors may prefer the two-stateroom layout, in which the starboard cabin, which shares the aft end of the hull with the portside lazarette, gains a bit of width. The head, also to port, moves farther aft and becomes larger as well, although there is no separate shower stall in either layout. As the head moves aft, this makes room for a small aft-facing nav station that shares a seat with the port settee. 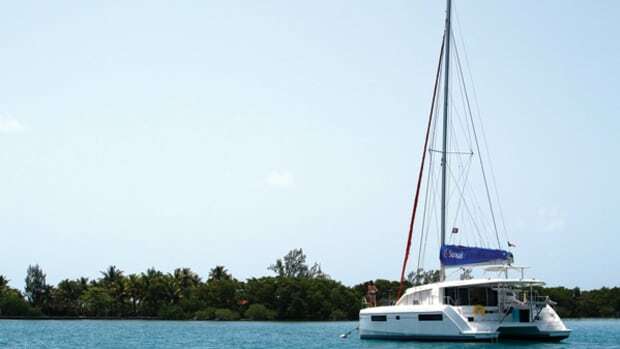 The L-shaped galley opposite has a single sink, a two-burner stove and a top-loading refrigerator. It’s not large, but it is completely workable and fully up to the task of turning out good meals for a weekend or longer. The placement of the galley, saloon and forward stateroom remains the same in both the two and three-cabin layouts. Two hatches over the drop-leaf table bring lots of light into the saloon, and with the door to the owner’s cabin open, the boat seems especially spacious and inviting. Quality details include dovetailed joinery, solid wood doorframes and counter fiddles, a choice of wood finishes and integrated hatch and portlight shades. Another welcome quality is the lack of creaking—the boat was silent inside even as we bashed about during what proved to be an uncommonly rough test sail. in the fully-battened traditional mainsail, the little boat spent much of its time on its ear in the flat waters of the harbor. At a significant heeling angle, good foot bracing wasn’t easy for me to find at the wheel, but the real challenge for the crew was tacking and managing the headsail sheets as we became accustomed to the boat’s layout. Once we got the hang of it, though, we appreciated how even a short waterline could turn out good speed. With her 549ft of upwind sail area, the Cruiser 34 really put her shoulder down and cut through the small chop. In 18-20 knots of true wind, we sailed 6.6 knots at a 45-degree apparent wind angle. As we eased off to 60 degrees, the boat sped up to 7.3 knots, and as we turned downwind, everything smoothed out, and we came back up on our feet still reeling off 6.2 knots at 150 degrees. The standard 6ft 6in keel would be my preference over the optional 5ft 2in version to help keep the boat upright in boisterous conditions. However, draft will be dictated by your local cruising grounds. The shallow waters found along much of the East Coast can be especially unforgiving of anything over 6ft. 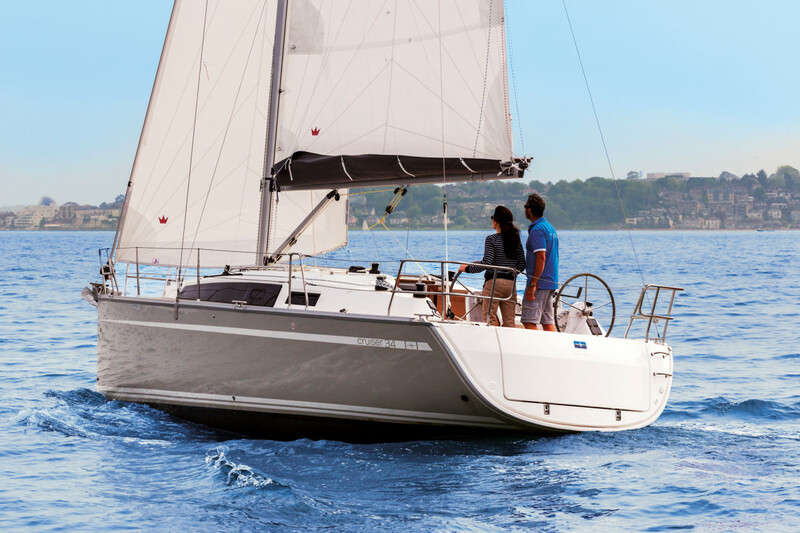 The Bavaria Cruiser 34 is spry with the sails down and motoring with her Volvo Penta 20hp diesel and three-bladed folding propeller. (An upgrade to 30hp is available.) 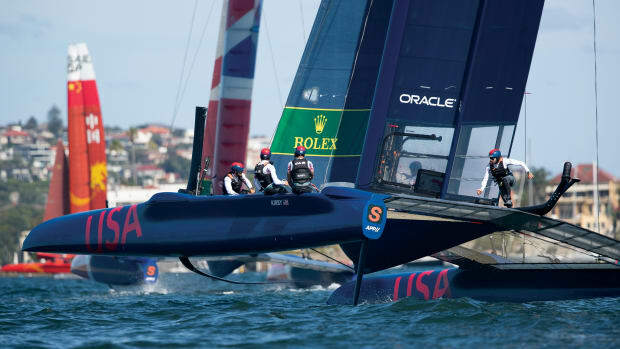 At wide-open-throttle, we reached 7.3 knots at 3,050 rpm. A nice cruising speed is 6.2 knots at 2,500 rpm. Tankage is 33 gal for both fuel and water. A larger boat with more ballast and a longer waterline may have ridden out the gusts better during our test sail. However, those conditions are fairly rare, and in the end, we did have a zipping-good ride at every point of sail. This boat can definitely go. Bavaria’s tag line for this design is, “The smaller yacht for massive fun,” and they’re onto something there. 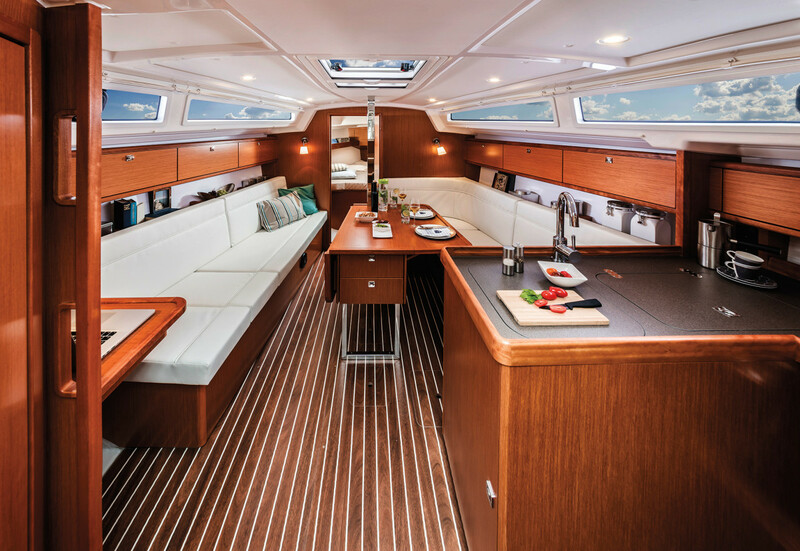 The Cruiser 34 is a tidy package with enough stowage space, sleeping accommodations and galley amenities for extended cruising, but she’ll still be comfortable in a 33ft slip—no mean feat.